October 5, 2012 is the second annual Plaidurday, a day to celebrate the joys of plaid. What a great idea! This brilliance is thanks to plaid-admirer Bugsy Sailor. Mr. Sailor decided in 2010 that it was time the world pay homage to the crossbarred pattern. All it takes is the wearin’ of the plaid. 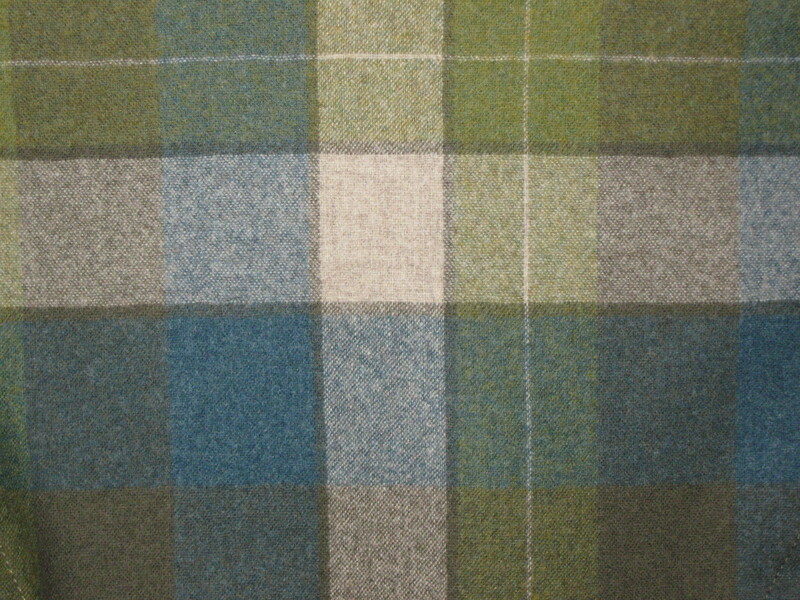 Plaid is a Gaelic word for blanket. There are four basic types of plaids – Tartan, Glen, Buffalo Check, and Madras. Tartan plaid patterns originated in Scotland and are connected with the various clans of the country. Queen Victoria’s affection for all things Scottish, including plaids, popularized the fabric and our fascination continues. My mother is a big fan of plaid and she would dress me in plaid jumpers when I was a child. That stuck and I’ve been attracted ever since. 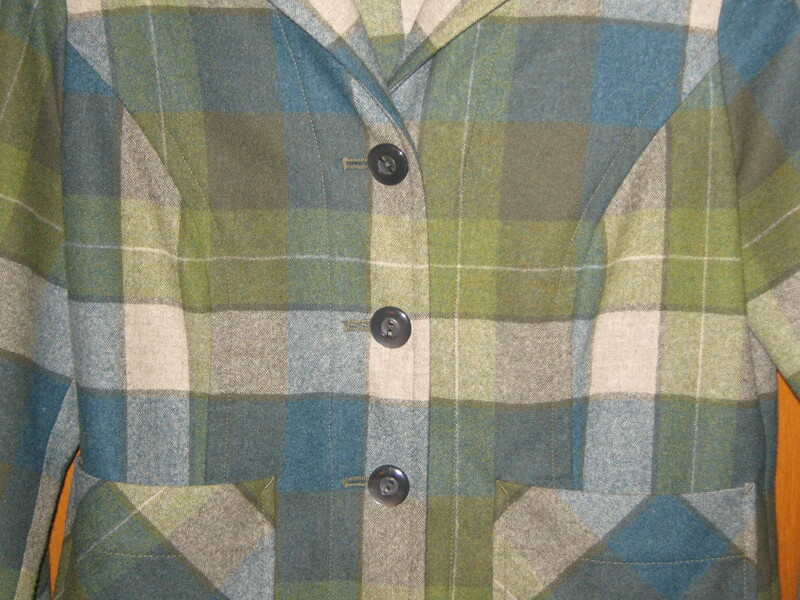 As long as it’s cool enough that day, I’m going to sport my new favorite plaid (American made) Pendleton jacket. In various shades of green, this jacket fits perfectly (rare for my petite frame) and looks like a well-kept vintage piece. Join in and sport your best plaid for Plaidurday. 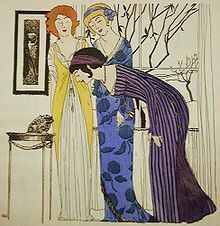 Poiret designs illustrated by Paul Iribe, 1908. A dress, like a faithful portrait, reflects a state of love. – French fashion designer Paul Poiret. An innovative designer of the early 1900s, Poiret is credited with shifting women’s clothing design from tailored to more simple structures. 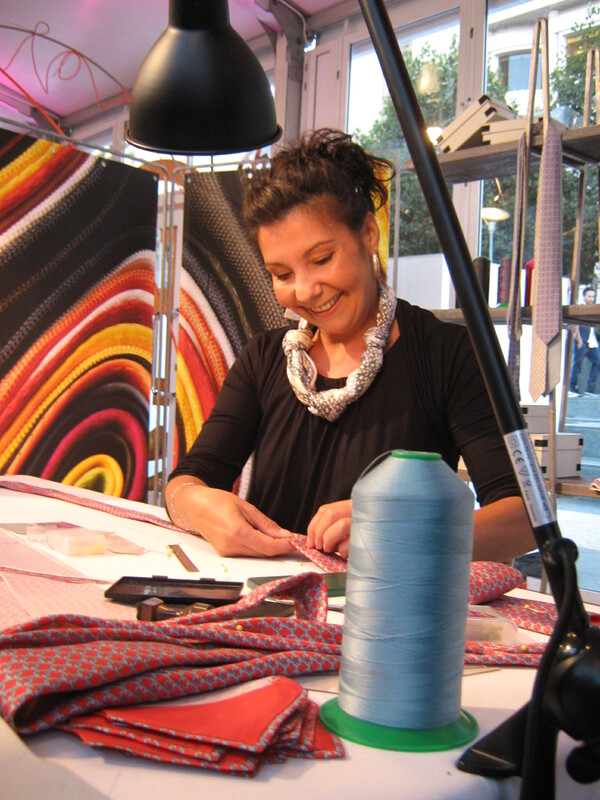 Hermès artisans start off as apprentices. Photo: Richard Aiello. Last night I was lucky enough to attend the opening reception of the Hermès Ateliers Exhibition located in San Francisco’s Union Square Park. 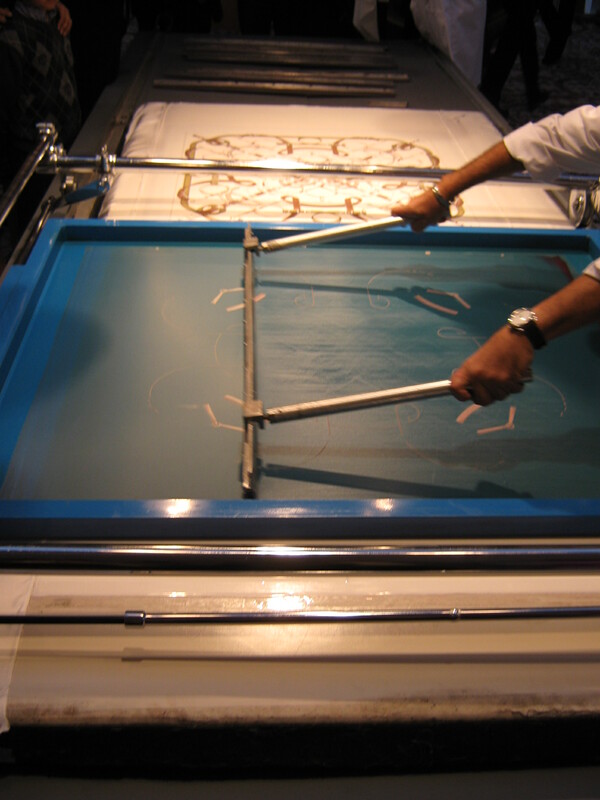 My fellow attendees and I got to see up-close how the goods of Hermès are handcrafted by trained artisans, many of whom have been working with the luxury brand for decades. Circulating the pavilion, we sipped cocktails while watching demonstrations of screen-printing, stone setting, final hand stitching on a tie, detailing on leather handbags, creation of buttonholes, and much more. Local translators were hired to help explain the various processes and answer questions on behalf of the artisans who traveled to San Francisco from France. What a treat to meet the people behind the goods as well as see and better appreciate their craft. The exhibition is open to all now through September 24, 2012, 11am to 6pm. I highly recommend this rare opportunity. 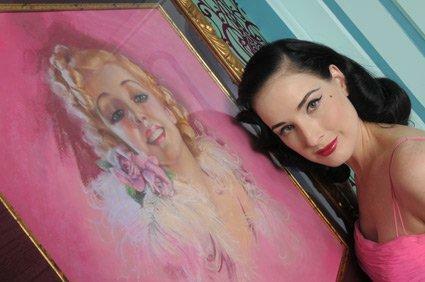 Dita Von Teese shops the Expo. Photo courtesy of Vintage Fashion Expo. Local shoppers are abuzz with the approaching fall Vintage Fashion Expo this weekend September 22-23 at the Concourse Exhibition Center in San Francisco. The Vintage Fashion Expo brings together dealers from around the country to offer an array of treasures from the early 1900s to the 1980s. Vintage Vogue’s Barbara Grigg will be there displaying designer gowns perfect for upcoming holiday parties and events. 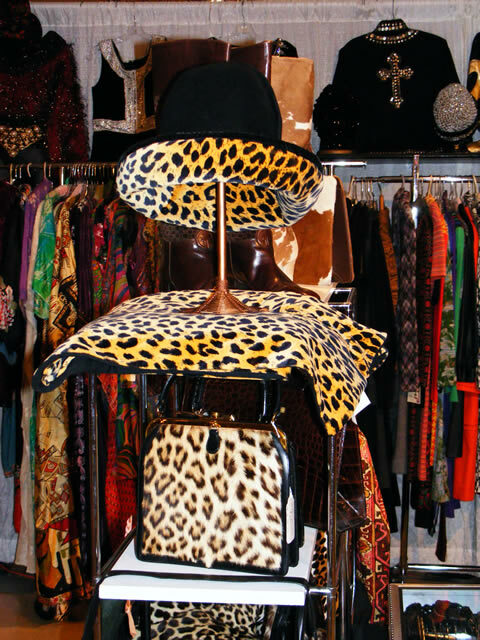 Marta Koehne of Hot Couture Vintage Fashion has a wide selection of chic winter coats among other great finds. Hats are favored by Marc Jacobs, Jason Wu, and Giorgio Armani. YSL looks include daytime gloves. Miu Miu and Oscar de la Renta like structured handbags. Chunky pendants and brooches are the big news of the season. Hats and handbags to rival any modern design. Image courtesy of Vintage Fashion Expo. Hats, gloves, handbags, costume jewelry? The Expo has all that and more, including clothing for men and children. Plus celebrities! Dita Von Teese often shops the Expo as does designer and Fashion Star Contestant Lisa Hunter who finds inspiration while strolling the aisles. The Vintage Fashion Expo, September 22-23 at the Concourse Exhibition Center 635 Eighth Street, San Francisco. Click here for all the details. The Schiaparelli woman to me is a woman who knows what she wants, loves fashion with a twist, and has a sense of humor. Farida Khelfa, former model, filmmaker, and all around IT girl. Ms. Khelfa was recently named the ambassador of Schiaparelli, which has been acquired by Italian fashion businessman Diego Della Valle. No word yet on the chosen designer but the reinvented mason Schiaparelli is to open early in 2013. 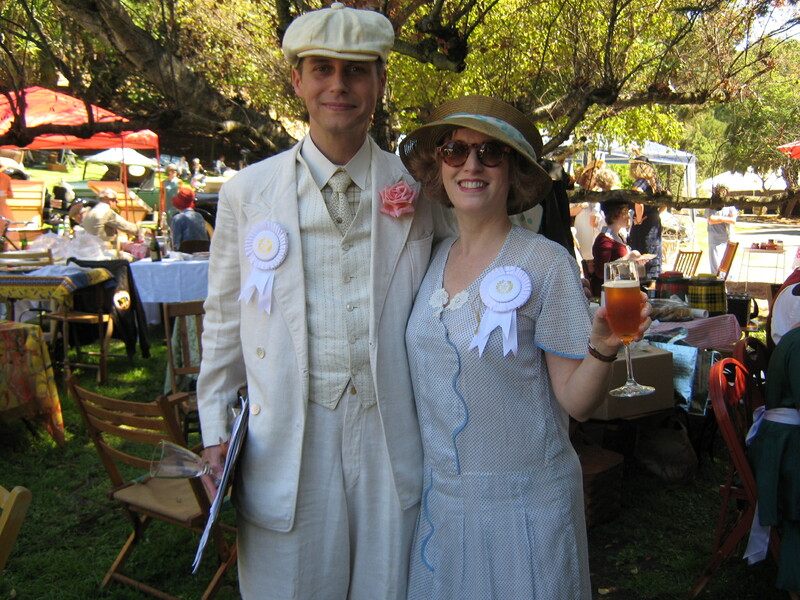 Jeffrey Jenkins and me at the 2012 Gatsby Summer Afternoon. Photo by Dorothy Brown. 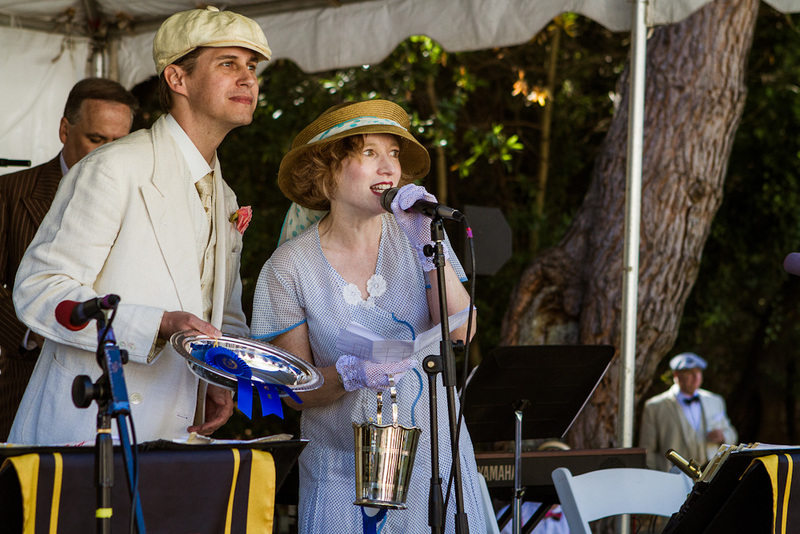 We really could not have had a more perfect late summer day for the 28th annual Gatsby Summer Afternoon. Close to 800 attendees had a swell time under the clear and bright blue sky. The warmth of sunrays blended nicely with a slight breeze to keep us all comfortable in our lightweight attire as we danced, chatted, and enjoyed this rare opportunity to live like it’s the Art Deco era all over again. For me and my judging partner it was bustling day of scrutinizing. Local actor, Jeffrey Jenkins, and I were Picnic Site Judges and we spent most of our time looking over sites deciding on what was the best in Small (2 to 4 people) and Grand (more than 4 people). It was quite the challenge as we checked appropriate period details (1920s to 1940s) in decor, food, and of course costumes are considered as well because folks within each site complete the picture. I was most impressed with people’s creativity and dedication to getting everything just right. One woman did all her own canning and used the vintage glass jars as part of her decor. Another lady, sporting a fine cloche hat, made a Jell-O mold using a recipe from a 1930s cookbook. A lovely woman set up her small site under a tree with an easel and she spent the day painting scenes of the crowd. Two women chose a story for themselves: It was election year 1936 and FDR was their guy. Included in the site were a 1930s American flag and a vintage bike. Overall what wins in both categories is authenticity, cohesion, and charm. Announcing the winners. Photo by Dorothy Brown. My outfit this year featured a 1920s cotton day dress in white with tiny blue polka dots. To echo the dress’ pattern I wrapped a blue and white polka dot scarf around my sunhat. Accessories included white lace gloves and a white beaded handbag. Comfortable and cool, this no-fuss frock was a happy find at the Vintage Fashion Expo. And boy did it receive a lot of compliments. Click here to see photos of the winning picnic sites as well as winners of all the contests – dance, costume, and classic car. I’m hoping readers will be inspired to join the fun next Gatsby Summer Afternoon set for Sunday, September 8th, 2013. 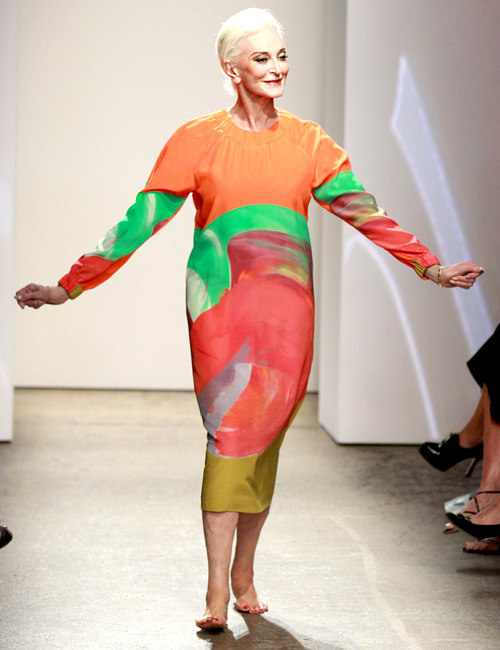 At 81 years-old Carmen Dell’Orefice rocked the runway this week in a colorful Marimekko shift dress. Ms. Dell’Orefice appeared twice for Spring 2013 Fashion Week in NYC. Love her, love the dress but what’s up with the bare feet? Even she can’t get away with that.